Do plan to rent a car. It is a much more pleasant experience to go on your own to explore the Cape of Good Hope than to be tied to large tour buses and their schedules. And some of the spots on our itinerary/drive are not included in the big tour groups. Automatic rental cars are available. Just make your reservation ahead of time. We suggest you go in a clockwise route such that you end the trip going through picturesque spots as the sun begins to go down: Chapman's Peak, Hout Bay, and Camp's Bay. Below is a map of what we did. We will go step-by-step below. For the first stop after leaving the confines of Cape Town, you will head south to False Bay to stop at St. James Beach. Here, you will make your Instagram dreams come true by seeing the famous colorful beach huts (changing rooms) along St. James Beach. In front of you will be gorgeous views of the beach towns dotting the horizon and behind you will be some mansions in the hills above. We primarily used this stop as a fun photo opportunity. We did not see too many tour groups here. We then headed south straight to Boulder's Beach to see some penguins! 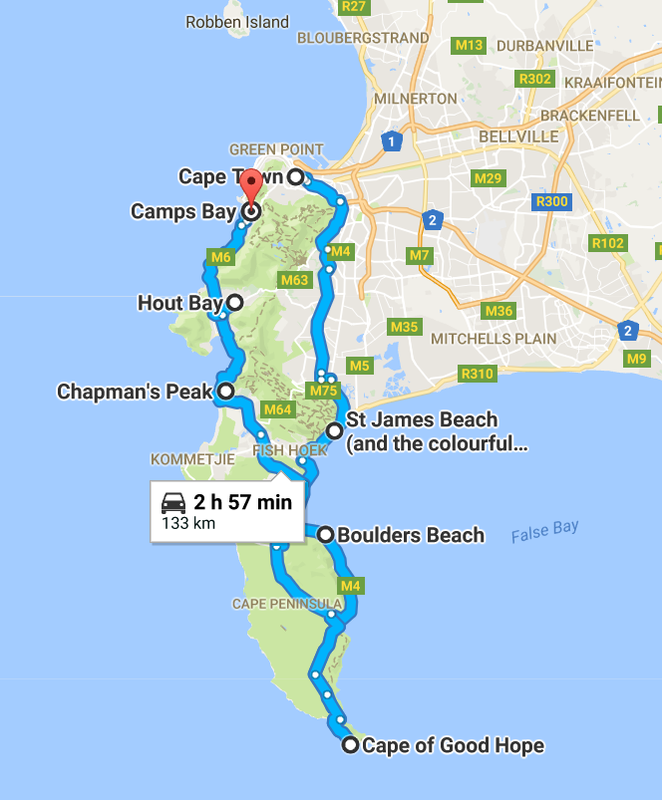 If you have more time, you may consider stops between St. James Beach and Boulder's Beach such as Kalk Bay, Fish Hoek, or Simon's Town. so close to the penguins! For our second stop, we headed down to Boulder's Beach to see the endangered African penguins. The only penguin species endemic to Africa, the natural range of the African Penguin extends across the southwestern part of the continent including Namibia and South Africa. Once estimated to have a population of over 4 million in the early 1800s, unfortunately the latest estimate is only at 55,000. One of the bright spots has been the success of conservation efforts in Boulder's Beach. 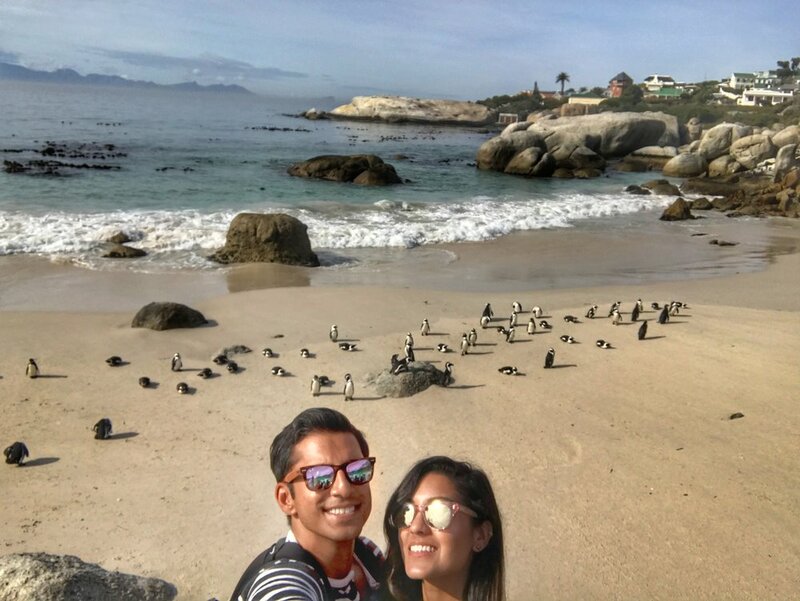 Here along a protected beach inlet with gorgeous large boulders, you will see numerous African penguins who seem to bask in the attention from the throngs of tourist admirers. Given the popularity of the stop, there are a lot of tour groups here so be patient to get some fun photos. Just outside the beach there are several small cafes to grab a quick sandwich or a cup of joe. Time Spent here: 60-90 minutes. Could spend much longer here if you are interested. While the fourth stop was actually Hout Bay, the entire Chapman's Peak drive will be one where you will be spoiled with spectacular views as the road hugs the vertical face of mountains that drive straight into the Atlantic Ocean. This is a toll road and goes from Noordhoek at its southern end to Hout Bay at its northern end. Built in the 1920s, its construction was an engineering marvel for its time. There are some small look points along the path and some great views as you look out from Hout Bay. There is a Lookout Cave at Chapman's Peak Drive with some great western ocean views that we did not get a chance to find/explore but if you have the time would definitely recommend: https://insideguide.co.za/cape-town/caves-cape-town/. If you are going to drive along Chapman's Peak, please make sure to check the website below to check road/weather conditions or renovation projects as this road may be temporarily closed. Time Spent here: 30 minutes in Hout Bay (this does not include driving time). Your final stop is to capture the sunset back in one of the most gorgeous neighborhoods in Cape Town: Camp's Bay. Camp's Bay feels like a mix of Miami and Santa Barbara with the gorgeous Twelve Apostles mountains behind you and the beautiful beaches in front. For some of the best pictures, we recommend going to the large boulders along the north end of Camp's Bay beach (where you may be able to capture some of the beach and mountains) and then walking/exploring Camp's Bay southwards along Victoria Rd. 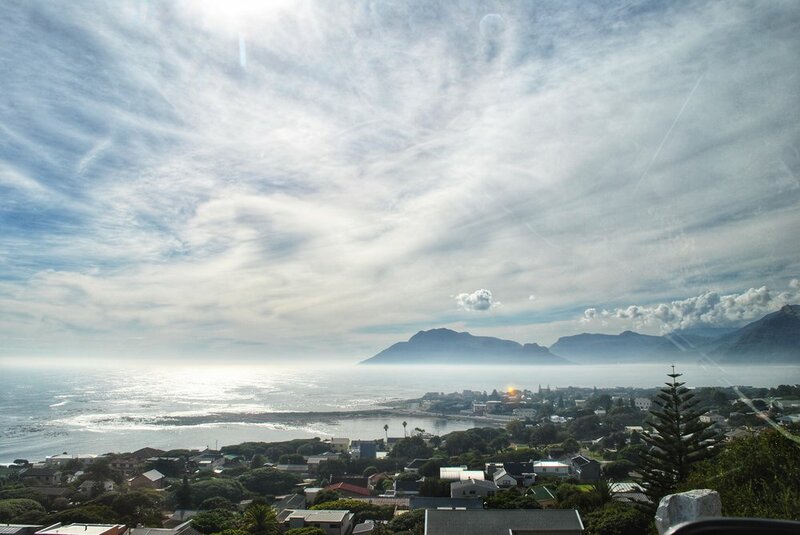 All of the neighborhoods in this region (Camp's Bay, Clifton's Beach, and Bantry Bay) are good neighborhoods to actually stay in especially if you are going in Cape Town's summer months and yearn to make the beach a big part of your holiday. After you long day on the road, soak in the twilight hours of your day at Camp's Bay and feel free to walk the promenade to patron one of the many cafes and restaurants. Time Spent here: 30 minutes on the beach (we went in Cape Town's fall so we didn't lay out on the beach). Then walk the promenade.